Flexibits, the producer of Fantastical, recently released a new app called Cardhop: It’s an app enabling you to manage your contacts by “using a simple sentence”. I’ve downloaded it some days ago and I’d call myself a fan of it already. It offers loads of great features which you can look up here. Using one of the app's core features in LaunchBar has improved my workflow enormously. Whichever contact you are searching for, type in any info you know about this contact: Is it its name, website or the address? You can even search for a note you added in a certain contact. In LaunchBar, open Preferences and go to Actions > Default Actions. Set “Contacts” to„Open Contact”. 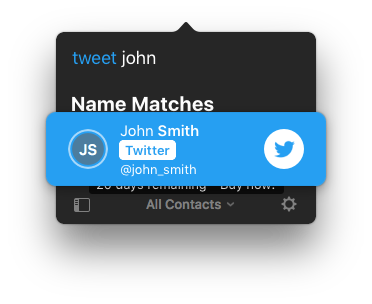 defaults write at.obdev.LaunchBar ShowInAddressBookURLPrefix "x-cardhop://show?id="
Want to call John? Type in “call John” and the app will follow your instruction instantly. Write him an email through typing “email John” or send him a tweet with “tweet John”. All this is just an overview of how Cardhop can improve your productivity together with LaunchBar. 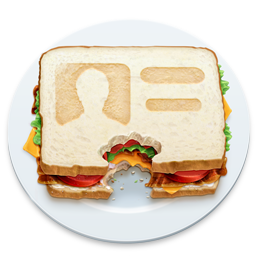 Nevertheless, I recommend you try out the contacts app that offers a lot more features which are worth exploring.